The National Association of Collegiate Directors of Athletics (NACDA) and CDW-G, a leading provider of technology solutions to education, government and health care, have announced Arizona State University as the winner of the inaugural Best Game Day Technology Experience Award. ASU was chosen from a pool of three finalists and received the award for its “Smart Campus” initiative. The award was designed to recognize NACDA member institutions in Division I, honoring athletics directors and their universities highlighting the ways technology plays a role in the fan experience. A five-person committee consisting of athletics directors across the country and representatives from CDW-G and NACDA aided in selecting ASU as this year's award winner. ASU will receive a trophy and $25,000 in Microsoft and Cisco technology products and services from CDW-G.
For the 2016-17 Sun Devil Football season, Arizona State University (ASU) began its “Smart Campus” initiative, implementing Internet of Things technologies to enrich the game-day experience. 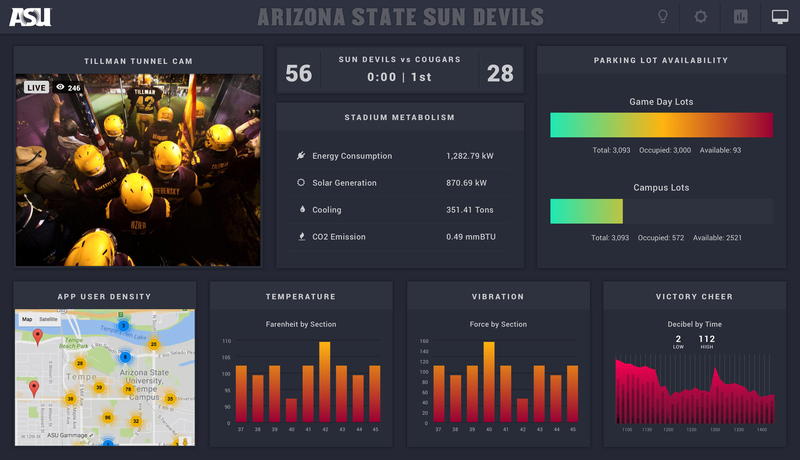 ASU utilized the new technologies to improve operational insights for facilities, create a unique suite experience for stakeholders, and enhance the game experience for fans. Its primary focuses were Smart Parking, a Smart Noise Meter and a Smart Suite, all of which utilized an inter-networking of devices to collect and exchange data in new and meaningful ways. Young African leaders find innovation during fellowship at ASU. A group of young African leaders has been visiting Arizona to learn how American institutions collaborate to solve problems — and also how sometimes they fail. Arizona State University is among several universities that are hosting the Mandela Washington Fellowship for Young African Leaders, an intensive six-week program of academic work and community service. This is the fourth year of the fellowship program, begun in 2014 as the main part of the Young African Leaders Initiative in the U.S. Department of State. The 50 fellows at ASU are from 28 countries in Africa and are in one of two study cohorts: civic leadership and public management. “It’s eye-opening for them to see the continuing issues we’re dealing with in the U.S.,” according to Alberto Olivas, the academic director for the civic leadership group. Olivas is executive director of the Congressman Ed Pastor Center for Politics and Public Service in the College of Public Service and Community Solutions at ASU, which is hosting the program. “A lot of them are surprised that we’re as frank as we are about the challenges we’re still dealing with in terms of racism. Homelessness as an issue has been very surprising for them,” he said. “It’s good for them to see that not everything is perfect in America, but here’s what we’re working on and here’s what we’ve learned so far in confronting these issues of race and class and historical conflicts,” Olivas said. The fellows are between the ages of 25 and 35 and are selected based on their accomplishments in their home countries. Many own their own businesses, lead nonprofit organizations or teach. While here, each scholar develops a project that he or she can implement back in the home community. They also learn practical skills, such as marketing strategies and the best way to write a grant application. Labran Alio Maidoukia is a fire captain in charge of security at a uranium processing plant in Niger, a French-speaking country in west Africa. “Uranium is like our bank account. So I’m in charge of the safety of our bank account,” he said. Maidoukia was hired by the United Nations to work with other countries in Africa on developing a response plan for terrorist attacks. “I am a fire captain, so I don’t have public management and policy skills. That’s what I’m looking for here,” he said. The fellows are meeting with several community organizations including the Tucson Urban League, Ability 360 and Native American Connections. The fellows have also had fun. The group has visited the Grand Canyon, Kartchner Caverns, the Musical Instrument Museum and an adventure course in Flagstaff. Shaakira Chohan, who is an architect in Johannesburg, South Africa, said the rope course taught her a lesson about leadership. Thierry Matabishi Musole, a Mandela fellow from the Democratic Republic of Congo, participates in an icebreaker exercise during a July 24 course on the fundamentals of grant writing at the Beus Center for Law and Society at ASU's Downtown Phoenix campus. Musole trains staff at the International Rescue Committee and was CEO of Aid and Action for Peace, a nonprofit group. Tsigereda Woldegiorgis, a Mandela fellow and civil engineer from Ethiopia, steps down from a ropes course during a leadership training exercise June 26 at Flagstaff Extreme Adventure Course. The fellows learned how to work as a team at the course. Bethel Shembu, a Mandela fellow and a social worker in her native Ethiopia, takes notes during a course on the fundamentals of grant writing taught by ASU lecturer Michael Shafer at the Beus Center for Law and Society at ASU's Downtown Phoenix campus. Shaakira Chohan, a Mandela fellow and architect from Johannesburg, South Africa, laughs with other fellows during a introduction training at the Flagstaff Extreme Adventure Course. The brutal summer heat has been challenging for some of the scholars. Chohan said that as an architect, she was surprised by Phoenix. “It’s a desert climate but yet as I walk around the city, I haven’t seen a particularly responsive design, with elements like shading. Why is there so much tarmac?” she said. Olivas said that he has had to gather a lot of local expertise in his role as academic director. “It’s been a rediscovery of how rich this community is in expertise and talent and heart, and it’s been an opportunity to create new networks of mutual support within ASU and local institutions,” he said.